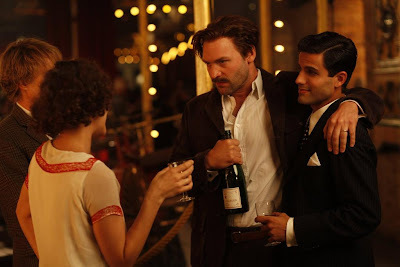 Top to bottom: in the movie, the character Gil Pender travels back in time to meet Adriana; Gil and Adriana talk with Ernest Hemingway; Zelda and F. Scott Fitzgerald. TD and I missed the movie Midnight in Paris, which was written and directed by Woody Allen, when it was in the movie theaters last summer, but we recently watched it on pay-per-view and enjoyed it immensely. Last night the movie won the award for best screenplay at the Golden Globes but the elusive Mr. Allen was not in the audience to receive his trophy. If you haven't seen it yet I highly recommend it. In it, the main character Gil Pender, played by Owen Wilson, travels back in time to Paris in the 1920s. 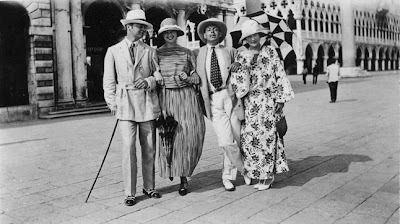 I don't know about you, but I am fascinated by Paris in the 1920's when so many artists and writers were living and working there. Hemingway wrote about the era in his book A Moveable Feast which I think I have read five times. Hemingway along with F. Scott Fitzgerald, Cole Porter, Pablo Picasso, T. S. Eliot, Josephine Baker, Gertrude Stein, Alice B. Toklas, Salvador Dali, and Man Ray all make appearances in Midnight in Paris, and it's such a delight to see all these artists show up on screen. In different media, the artists in Paris in the 20's created the culture of the twentieth century. I was wishing the movie would go on and on and not end. And one is left thinking, who is left out of the cast here? Coco Chanel. Igor Stravinsky. James Joyce. Publisher Sylvia Beach who owned the influential bookstore Shakespeare and Company. And the Murphys. The Murphys of course were Sara and Gerald from New York City. 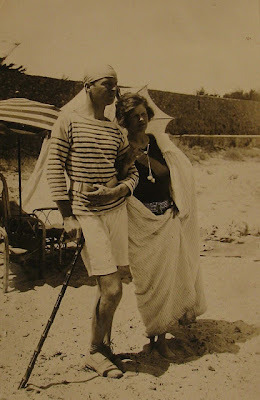 The couple escaped a stifling life in the United States and set up house in a villa on the French Riveria where they entertained most of the artists listed about and created a life of beauty and art informed by their American way of easy, relaxed elegance. Living Well is the Best Revenge by Calvin Tomkins and Everybody Was So Young by Amanda Vaill are two wonderful books about the Murphys. Gerald and Sara on the beach at Cap D'Antibe. Traveling in Venice with Cole and Linda Porter. Gerald Murphy on his boat photographed by Man Ray. The Murphys were renowned for their style of living, and inspired a recent traveling museum exhibition entitled Making It New. The catalogue stated that for the Murphys, "Life itself became a seminal work of art. The artist redefines the terms and conventions of life without necessarily leaving a single art work object behind." Although the Murphys suffered great tragedy when two of their three children died of disease, and Gerald struggled with his homosexuality, they remain a great lasting inspiration. And Paris in the 20's is a gift that keeps on giving. I did recently hear about the Edith Wharton anniversary - and that is a good idea! Thanks for your lovely comment. I have recently read Everybody was so Young & absolutely loved it. I seem to be stuck in that fascinating era.... then I read Tender Is the Night in which F Scott Fitzgerald wrote about a couple modelled on the Murphys ,who were not too happy about this expose´ and their friendship was never quite the same again.